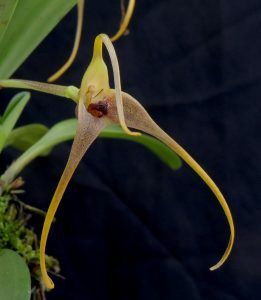 Masdevallia hystrix is one of our smelliest orchids with a strong scent described by students as similar to sick or pooh! – it always gets a reaction. 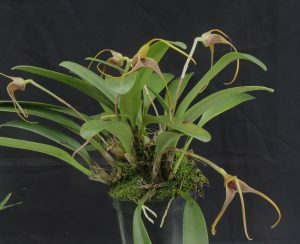 Masdevallia hystrix grows in Ecuador at around 2500m in cool evergreen forest. We have noticed that its leaves are easily damages by bright summer sunshine or high temperatures so cool and shady is where it likes to grow. The flowers are large with a spam of 15cm from the tips of the tails. Lookout to for the prickly lip that gives the species its name. Hystrix is latin for porcupine!